Fresh, bright green mint leaves! Refreshing and invigorating to your senses and your taste buds! 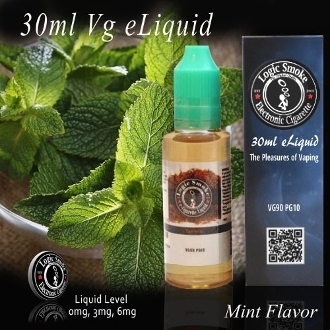 This is what you'll get when vaping Logic Smoke Mint flavored electronic cigarette e-liquid. It's a light mint e liquid flavors. Not too strong or overpowering. A refreshing vape all on its own but also a fabulous mixer. Logic Smoke Mint flavored e-liquid tastes awesome when a few drops are mixed into your favorite fruity flavors. Or mix with White Chocolate for a fresh chocolaty mint treat! Add some Chocolate Cream and a touch of Mint to our Coffee e liquid flavors for an Irish coffee experience. See what creations you can make today!